Floods have inundated 11 sub-districts, displaced some 1.8 thousand people, and claimed one life in Bandung District, West Java Province, according to the Bandung disaster mitigation office (BPBD). A study by Singapore-based research company ValueChampion has found that Indonesia is the second-most dangerous country for women in the Asia Pacific region. The Environmental Affairs and Forestry Ministry`s Forest and Land Fire Control Brigade, Manggala Agni, and stakeholders joining a forest fire task force, is currently focusing on preventive measures against the occurrence of forest fires in Riau Province. The search and rescue operation carried out after a gold mine collapse in central Indonesia ended Thursday, with the death toll standing at 27, according to Indonesian disaster agency authorities. An Amnesty board member has been arrested by Indonesian police after a video of him singing a protest song critical of the country’s military was circulated online. Hundreds of residents of Pesanggrahan, Kroya district, Cilacap regency, Central Java, participated in a parade on Monday, carrying jolen (miniature houses). The risk to rescuers from constant rock falls has ended the search for dozens of people killed in an Indonesian gold mine collapse, the search and rescue agency said Thursday, leaving an unknown number buried. The importance of Indonesia as a trading partner with Australia was further reinforced this week with the formal signing of the Indonesia-Australia Comprehensive Economic Partnership Agreement. 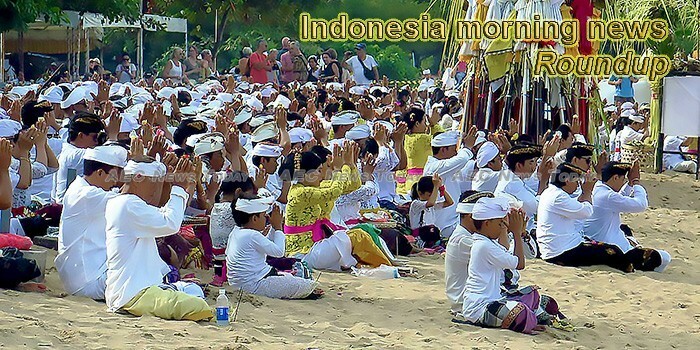 President Joko Widodo or Jokowi sent a special message to the Hindu community across Indonesia who are commemorating the Day of Silence, or Nyepi. Health Minister Nila Moeloek received the Holmes Lecture Award 2019 from the Asia-Pacific Academy of Ophthalmology (APAO) for her contribution to global health development and supporting eye health care programs in the Asia-Pacific region. Direct investors from Indonesia have been ignoring Cambodia despite trade and tourism between the two countries growing annually, the Indonesian Ambassador to Cambodia Sudirman Haseng said. Jakartans have claimed they had not noticed the massive shake-up Governor Anies Baswedan recently conducted in his administration, but hoped it would lead to improvements made on public services that have been on the decline in recent years. Fears Chinese-backed project will flood forest that is home to the most critically endangered species of ape. The quota left for the free trial of MRT Jakarta on Thursday, March 7, is 140,000 tickets from the target of 285,600. Activists and scholars are protesting against the National Police’s arrest of university lecturer Robertus Robet for allegedly spreading hate speech against the Indonesian Military (TNI). Indonesian courts have been handing down tough sentences to business operators who scammed customers, promising them cut-price pilgrimages to the holy places of Islam but then failing to deliver. In commemorating the Nyepi Day 1941 Saka New Year, Sea World Ancol will hold a cultural show dubbed ‘Barongan: An Epic Underwater Show’. Mount Merapi in Yogyakarta released a hot cloud of avalanches on Thursday morning, (Mar 7), with the emission reaching 1,200 meters, Center for Research and Development of Geological Disaster Technology (BPPTKG) reported. Calm has yet to return to Nduga regency in Indonesia’s Papua province where separatist rebels killed 19 construction workers in December, forcing residents to flee to escape clashes between the insurgents and government security forces, officials and residents said Wednesday. Weeks ahead of the presidential election in April, President Joko “Jokowi” Widodo surprised passengers of Jakarta’s commuter line (KRL) by boarding one of its trains during rush hour on Wednesday afternoon. Alqadrie Center (YAC), Indonesian Conflict and Peace Study Network, in collaboration with the University of Bath, England, and West Kalimantan Provincial Government, held an international seminar covering topics on building peace in the 2019 Election. Words like kafir, or infidel (non-believer), have always flowed easily off the lips of Indonesia’s Islamic militants and other hardliners whose hateful racist attitudes towards foreigners are matched by their undisguised loathing of their own religious minorities and fellow Indonesians. No imagination is needed to know why William Dampier named the westernmost part of Australia Shark Bay. IT and consumer electronics channel distributor Synnex Technology International has inaugurated a logistics center in Jakarta, Indonesia to strengthen its operation and competitiveness in the country. Workers from Aceh Natural Resources Conservation Agency (BKSDA) install a GPS collar on a wild Sumatran elephant in the East Aceh forest in Aceh, Indonesia, March 6, 2019. The Executive Director of the Center for Maritime Studies for Humanity, Abdul Halim, stated that Indonesia needed to follow the example of India`s National Diving Committee tasked with managing salt commodities. With the Indonesian presidential and legislative elections just over a month away on 17 April, Talking Indonesia is switching to a weekly format to cover the key themes, important groups and pivotal developments that will shape the outcome. The Indonesia stock market on Wednesday snapped the two-day slide in which it had stumbled almost 60 points or 0.9 percent. Minister of Tourism Arief Yahya led an Indonesian delegation to the world`s largest tourism exhibition market that was attended by 10 thousand participants from 180 countries. It seems some of the world’s favourite pop songs aren’t to everybody’s tastes. President Joko Widodo (Jokowi) has underscored the need to involve the private sector in the effort to achieve the economic growth target for 2019 and 2020.